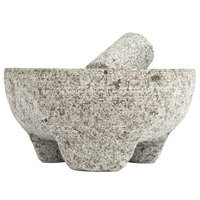 This authentic molcajete-style 8" granite mortar and pestle is perfect for crushing and blending hard ingredients, vegetables, and spices. From pulverizing nuts to mashing chickpeas to grinding fragrant herbs, it is an indispensable kitchen tool for preparing a variety of dishes. Far from the typical apothecary mortar and pestle, this set is made of porous granite which gives it an earthy, natural look. Additionally, the granite will season itself over time and release more flavor into your ingredients. The reason for the 1 star review is that it does not have a smooth bottom. It scratched up our counter tops. It was extremely disappointing. This is a very nicely made mortar and pestle. The bowl is unpolished in order to add friction when you grind. The top rim and pestle are nicely finished and polished and the pestle feels good in your hand. It is also very strong and does not chip and flake. Buy this one with confidence. The weight of this unit is excellent, not so heavy that it becomes difficult to move, but heavy enough that it won't move during use. The texture of the bowl and pestle allow the user to gain a real bite on the foods being crushed. This is a really solid tool. It's not a designer piece that exists for show. The outside is mostly unfinished and rough, but that's irrelevant. It is a heavy granite Mortar and Pestle designed to get the work done. The weight is a great thing because it does keep the tool in place while working it. I went through a thorough seasoning procedure (http://eatbufordhighway.com/cooking/the-mortar-pestle-seasoning/) and it's been good to go ever since. I don't think you can do better for 3 times the price. This super heavy duty mortar and pestle will last forever. I use it for all my spice grinding - black pepper, cumin, etc. It is also especially useful for breaking down whole pecans, walnuts or almonds. Much faster than chopping them. Pretty heavy considering the size of it. High quality Just wasn't big enough for our needs. Other than that works and smashes great with all kinds of different foods. This is a nice mortar and pestle, as others have stated. It's a good size and had rough-but-not too rough interior. The mortar rim and pestle body are both nicely polished. It would be nice if the mortar bottom had been polished as well. Mine arrived with a curious defect. The inside was filled with smears of black stuff that looked a lot like latex caulk, but harder like plastic. Something must have gotten into the bowl while the interior surface was being ground because it was melted into the surface. Fortunately it was brittle. Ten minutes with the tip of a razor blade was enough to chip it all out, so no harm done except for some wasted time. Nice product at a good price otherwise. I was not impressed with the quality of this mortar and pestle. In my opinion it is too unfinished. The granite is very porous and rough with leaves pits for food to hide. The contour of the bowl was not gradual rendering only part of the bowl useful for grinding. The worst aspect is the bottom... not only is it so rough and abrasive that it will destroy any counter it touches, but mine was also uneven causing the mortar to rock side to side when grinding. I will search for a replacement instead. This mortar and pestle set is amazing. Large, solid and stable, it will crush anything you throw into it. Made of one piece of granite, it takes care of even the toughest jobs with ease. The mortar exterior comes unfinished however, so it really produces that organic and earthy appearance for your kitchen. Seriously, it's an impressive looking piece that my guests always comment on. Since it is 8", it's very easy to crush seeds, nuts, etc, without spilling - I would always recommend getting the largest size you can handle. The bottom of the granite is also unfinished, so I make sure to keep it on top of a rattan coaster so it doesn't scratch up my countertops. I love this Mortar and Pestle set. Very well made and heavy. I seasoned it over the weekend and am now ;looking forward to using it for my custom spice and salt blends. I also can't wait to make some authentic homemade guacamole in it - my other mortar is too small. This is the best size mortar and pestle for me. It's a good balance between counter space and functionality. I use it mostly for grinding dry spices but it also works great for small amounts of rice for thickening and making curry pastes. Pretty much anything you wouldn't want to dirty your food processor for. I would recommend. Great value! If you use a mortar and pestle you want to get the largest one possible, not only for ease of crushing/grinding (larger means more weight in the pestle which will do the work rather than your muscles) but also for ease of containing the ingredients. It is easier to crush a small amount in a large mortar than a large amount in a small one. So far I have used this for herbs and spices and garlic - but I need to remember to use it more. Next step, Caesar dressing! This is a really nice large mortar for high volume performance! Quality of this product is just outstanding! It is very heavy which is important for this kind of product! I would recommend this product! Excellent mortar and pestle for the price. Be aware that it is quite heavy. It looks great, and it appears the granite is good quality so far. Nice heavy mortar and pestle that I highly recommend, but I was disappointed that it arrived with a substantial chunk missing from the top outside rim. It was not caused by shipping because there were no loose pieces in the box. I know it won't affect performance, so it's not worth the expense and hassle of returning it. But it annoys me that I received a flawed product. Thanks for the feedback, Jodi! We're sorry this was damaged. A Customer Solutions Representative will contact you shortly. This ,mortar and pestle set is not only beautiful but it does a great job for crushing herbs and spices! My favorite is to use it for mint leaves for drinks. This is a great mortar and pestle set. Solid and heavy. We use it for grinding up our house rub for pulled pork. Should last forever. Absolutely love my mortar & pestle set! Makes grinding the herbs down much faster and easier! Anyone would love this! Nice and big and sturdy and durable! This mortar and pestle set is so fun! It's good quality and would probably break you before you could break it. It's great for grinding spices, coffee, or even for making fresh guacamole. Word to the wise: don't drop the pestle on your fingers. The texture inside and on the end is great - it grips spices and such well and keeps them from spitting out like on porcelain - but the shaft is smooth, and can get a little slippery if it's wet or oily. Still a great tool at a good price. This large and sturdy mortar will do well at crushing spices such as black pepper, cardamom, coriander, cumin, etc. The stone is hard, dense, gives off very little stone dust once seasoned, and has good friction for grinding hard spices down. I seasoned mine by crushing rice and a little vinegar together for about 15 minutes into a fine paste and then discarding the paste. This 8" granite mortar and pestle set is perfect for grinding spices to order. You simply fill the bowl with the ingredients and use the stick to crush them. I purchased this for my home so I can grind spices the old fashioned way. I will definitely be back to buy one as a gift for a friend. Great for several uses and good to have around. Never used to use one until now and I use it all the time. Good quality at a great price. Iam very excited to share the review on this wonderful granite mortar....i belong to a country of spices and was looking for a good granite mortar that grinds all my spices to a fine level...at last i got the best ever mortar...i love the shape,the depth and the weight...it is not too heavy ,it has good depth that does not split the spices out and its very beautiful on my counter...i can keep on say good things about it because iam totally in love with it. a terrific little piece of equipment. we don't use it that often but it works very well when we do. a very good price besides. Heavy duty quality! This mortar & pestle has a solid base and deep bowl for ease of use. I've had other grocery store bought granite mortar & pestles and nothing compares to the 8" mortar and pestle. As with previous orders Webstaraunt knows how to securely pack their products for shipping. Love my mortar and pestle from Webstaurant! Best price I could find, great quality, durable. large enough for all my needs and nice and sturdy! Super nice mortar and pestle. Love the nice long handle, and rough finish on the granite. Has to be seasoned, but once it is, does a great job of allowing you to dial in the perfect grind on things. Great for grinding spices/seeds, especially when an electric grinder might be overkill. Heavy and solid as a rock (because it is one). Also great for smashing garlic and making pastes. I'm really happy with this mortar and pestle set. It is very heavy, which helps keep it in place. Plus it's much larger than my old one. I also actually like the rustic way it looks. This was also the cheapest price I found anywhere. If you need a mortar and pestle, I think you will be happy with this. I love using this over the spice grinder because it's easier to clean, and easier to gauge how fine you want your spices to be. I love having one of these in the kitchen. Whatever you do though, don't drop it! This is a nice mortar and pestle set that is larger than most you find elsewhere. It is easy to clean and the pestle is comfortable to use. This is a good investment if you are looking for a slightly larger set than those you normally find in retail stores or elsewhere online. i used this item for to grind up mustard seed to make my home made mustard. or you can used this item for any thing used . the reason I purchased an 8 inches one is that the price is not bad and the shipping was not bad either, together it is affordable and it grinds fast with salt and spices at the same time. it does not take up much room to store it and it is a good investment for someone who likes to cook with various spices. Won't be sorry to buy one to use. the big size makes everything stays in the bowl. An absolute great buy for quality and price. These get the job done and are very durable as well. I highly recommend these and I will buy more when I need them. It is very heavy duty and just plain HEAVY but great. This mortar and pestle set is massive, weighty, and actually quite attractive. Be sure to season and clean using a bit of dry rice before using. This is a nice tool for grinding or crushing freshly toasted nuts and seed before adding them to a dish! It is easier to clean than a spice grinder!!!! The price and quality are amazing. The set arrived well packaged, and is extremely heavy, always a desirable thing with mortars and pestles. We had trouble finding a decent pestle. It is easy to find heavy mortars, but the pestles were always lightweight. Not so with this one. The pestle is a good weight as well. I love this mortar and pestle. It is great for spices. I like the depth of it. I am anxious to try using it for making guacamole. You won't find a better price. This mortar and pestle is so heavy that you do not have to worry about the bowl slipping on the counter top. There isn't anything the set can't handle. This granite mortar and pestle set is perfect for crushing any whole spices down. We crush cinnamon, gloves, and pepper usually. It works really great. Any kitchen needs to have one of these! If you want a great way to get the most flavor out of your spices, than this is a must buy. These are so great to have! Especially for restaurants that mill or roll their own grains. Try making flour or masa in one of these! You'll never go back! I love this mortar and pestle. I never have to worry about slippage or comfortability using the pestle. It is very convenient and heavy! I never have to worry about the mortar moving. So easy to clean once you know how. For all oily or sticky foods such as bananas or walnuts, use a mild dish washing liquid. Any questions? The wesbstaurantstore.com team are always happy to help. I got my parcel so quick! I was very happy with the packaging as my item was untouched by scratches or chips. As a first time buyer, I would definately highly recommend this product. When you first receive it, it may feel grainy. All it needs is a good washing and it is ready to go. I will definately be shopping with them again.